How are you feeling and what is the extent of your injury? Talk me through exactly what happened, did you know straight away that you caused yourself an injury? Yeah I knew straight away but from what happened last year with a broken collar bone and not being able to race – I was so disappointed. It was another error on my part, but we have to look into it because it was one of those things – there were three guys who crashed on exactly the same lap and we all had the used tyre from the afternoon before, we saved the tyre overnight. I was actually coming into the pits on that lap so wasn’t pushing very hard at all and then suddenly high-sided the bike but I managed to shut the throttle fast enough where I actually fell off the side of the bike in the end but it was still a very big crash, and I hit my head quite hard as well which was one of the worst things so I was a little bit dazed at the side of the track so I couldn’t get up anyway because of my ankle but it was a painful experience but I knew straight away I had done something to my ankle because of the pain. But, if someone would have asked me when I was lying on the gravel was I racing the next day, I would’ve said no but it was thanks to a lot of people, the medical staff helped us out great at the circuit and we managed to make the grid on the Sunday. If it wasn’t your home track, and it wasn’t in front of a home crowd, do you think you would you have raced with the injury? I don’t know, a few people have asked me that same question and it’s hard to say. Obviously my passion is to race a motorcycle and you’d do anything to be on the grid, but no, probably I would have sat it out. But I felt I had a big loyalty to the British fans, the people who turn up, there were so many people there with flags and with t-shirts that they’d bought and they still came out on the Sunday knowing that I may not be riding, so I felt I owed it to them as well as my team for doing such a good job. I never made last year’s race so I had to get out there on the grid! Is Silverstone feeling a bit jinxed for you? I don’t know, I think next year I'm just going to cruise around or maybe sit the practice and qualifying out and just try to do the race. Third time lucky I might have a decent race weekend! Off the track, do you actually ride on a motorbike? I do; I have a motorcycle licence and luckily enough Yamaha manage to provide us with a fantastic bike all the time but there’s also one thing - you’ve got to be careful having a motorcycle on the road and with the campaign I’m supporting – www.bikerpetition.co.uk – at the minute we’re trying to get a compulsory question in the UK driving test because we want to make drivers aware of motorcyclists on the road. On Saturday at 2pm we need to get 100,000 signatures. We’ve now got 68,000 so hopefully we can have a big push in these next few days to get that up to 100,000 and it will then hopefully be mandatory that there’s a question in every driving test in the UK on motorcycles. 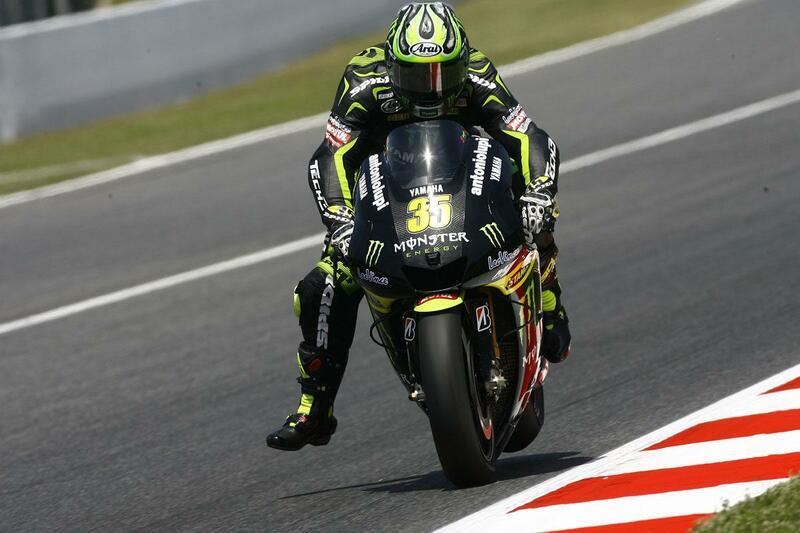 Matt Whittaker has asked; So, when is Cal Crutchlow looking to be Cal Crutch-less? How long do you think you’ll take to heal? I don’t know, the doctors said 8-10 weeks of no weight-bearing at all but I’ve come back and seen my own doctor and already I’m weight bearing on it so, I have to be very careful because I don’t want to make the injury worse but I am a motorcycle racer and I have to push the boundaries. I’m an athlete so I want to get back out, training as much as possible, as soon as possible so the way that I look at it is that if I can race a motorcycle the day after then I can push the boundaries a little bit! I did a bit of cycling today in a gym under a controlled environment but by the end of the week I hope to be cycling outside. But that’s me – I don’t like to leave anything to settle, if it settles, it just seizes up or locks up so hopefully I’ll get rid of the crutches very very soon. Walking on it is probably the most painful thing actually. At night it’s quite hard going as it swells up a lot but we have to control it with the ice and compression but also do stuff with the physios and the doctors so hopefully I can get rid of the crutches very soon. You’ve got three races consecutively coming up now, are you hoping to be on track for this weekend? I’ve got until next Tuesday so I’ve got a good week of really recovering and making sure the ankle is right. Obviously it’s going to be months before it’s perfect but I think if we can go into these next races a lot more comfortable, then that would be a lot more helpful. Dave Catling would like to know; If you had been on the front row of the grid, would you have come first place on Sunday!? I don’t know, it’s hard to say because looking at my race pace we could have been definitely on the podium 100%. Now, if you’re battling at the front, the way I look at it, there’s always two carrots – if there’s someone in front of you, then you’ve got to go and chase that carrot. If not, there’s a carrot pushing you from behind, if you’re leading. So I think that would have made it a little bit faster but I think my pace over the last ten laps was definitely faster than Jorge on a few laps, but a lot faster than the other guys on the podium so it would’ve been nice to say I would’ve been on the podium but it never happened, maybe next time! You moved an incredibly impressive amount of places up starting from the back of the grid to sixth so you must’ve been very proud, are you happy with that result? Yes. Its bittersweet - for me it’s great that I came through and it was emotional weekend, I missed out so much track time after the crash that to be able to come sixth after that, I think is a good result, but you’re always thinking what could have been. If you were riding a normal weekend and would have qualified on the front two rows, could I have challenged for the win? Potentially yes. Would I have challenged for a podium? Definitely. But it’s easier said than done. We finishd sixth and that was it – the positive as I look at it: we went into the race fifth in the Championship and came out fourth in the Championship so there is a good positive there. I think we did a good job. Next question is from Anne-Marie; What age did your passion for motorbikes start and what was your first motorbike? My dad used to race and I used to go to all the races as a youngster and I used to ride around in a little Yamaha PW50 but I was never mad into racing – I didn’t want to race as such at that age, which in all honesty I look at as a big disadvantage as the guys I race against now were riding when they were tiny – they were racing - so I always feel actually at a bit of a disadvantage. They’re a lot more natural than me in that sense. But I just played football. All I wanted to do was play football and be a footballer so all the way up until 12, I was playing football and then I decided I wanted to race a motorcycle and then I did three years of them clashing and that was a disaster! I was turning up at one with a broken arm and had the team manager going mad from that, then going to the other one with a dislocated knee from the other sport and then the other team manager going mad! So, I decided my heart was set in being a motorcycle racer and I just grew to love it even more. I would never have changed my decision although I still enjoy watching football - it’s so difficult I don’t get time to go to the games anymore but a few of the guys I played against or with are now decent players, but I wouldn’t change what I do for anything. Paul and Stella would like to know; Did you catch the mouse yet? It was actually a rat in the motor home and it was big! I was not overly impressed to be honest, I don’t like anything that moves too fast, so I was scared! I was pushing Lucy out, she had a stick and was trying to get it but in the end we had to move out of the motor home for the Jerez weekend and in the end we found it dead at Le Mans. We put poison down and it ate it so it must have died and we found it outside the motor home. That’s that one done and hopefully there’s no more! Claire Kimble has asked; Do you have a nickname or pet name for your bike? No not at all. I don’t know what it is, some riders have a liking to one bike and not the other and they’ll have a ‘number 1’ and a ‘number 2’ on it. I know my team mate Andrea, he names his bikes and it’s fine for people to do that, but I don’t care which one I get on and I don’t care what number it says on it - I just try and make them feel the same. Unless you’re looking for a different set up on one or the other, it doesn’t matter. But I don’t have any pet names for it. If you have a bond with a motorcycle when you’re naming them, when you crash them...what do you think? That’s the way I always look at it – I’d have to rename another one. I don’t have a bond with it like that! Michael has asked; Why do you use the race number 35? I get asked this quite a lot and it really is a good story! I was number 5 for many years and I couldn’t have 5, so I just stuck a 3 in front of it a year after – that’s it! There’s not a link to it – I always loved number 5 and I even thought about going back to it this year but Colin Edwards is number 5 and at the end of last year we thought he was retiring so I said to him, ‘I’m having your number next year’ and he said he wasn’t retiring and anyway kept number 35! But a few people like it now so I’ll stick to 35 as it’s a good number for me. Your father being a huge fan of the sport before, must’ve been thrilled really when you went through, did he hold back putting too much pressure on you? In all honesty, he went to a track, bought a bike the week before and I learnt how to ride it with gears. I went to a track and crashed on my first ever lap – he said, ‘this is not for you’ and I asked him to give me one more go and it worked out well. There was no pressure from him at all to ride a motorcycle and in all honesty he probably never wanted me to at the start - but obviously now things have changed and it’s now my life day in day out! Simon has asked; Can you tell us a little bit about the jump from Superbikes to MotoGP? A: It’s a massive jump and in all honesty, I struggled with it - it was a big big jump, and one that I thought I wasn’t going to struggle with and I had the conversation with James Toseland who was my teammate at the time. He’d been to the MotoGP, he’d been in the same team and he said they’re really tough and I said ‘yeah, yeah, yeah, I understand’, never took his advice that much but can completely sympathise with what he was saying about how tough it was, because last year was a really tough year – I ended up having six operations in six months from racing. If it wasn’t for the support of Lucy and the people who got me through last year, I was a really tough time. I just wanted to go back to what I knew which was Superbikes but in the end I started learn the MotoGP bike a lot more, changed my riding style and enjoy riding it. The gap between the factory bikes and our bikes got a lot bigger so it looked like we weren’t improving but we were – week on week making big strides. There are so many differences, the chassis are different, the electronics are different, the tyres, the whole environment of being in GP; there are 18 races instead of 12 - it was a long year! But last year was character building. We had a really tough year but Yamaha stuck behind me and a lot of people stuck by me now look at where we - we’ve made such a big jump from last year to this year, so hopefully we’ll continue on that jump next year as well! Michelle Goddard has asked; If you could race any bike, past or present, in any class which would it be? I’ve always wanted to ride an old 500 two stroke, I don’t know why I think it’s because they were aggressive, they were difficult to ride and I always feel like I’m a rider who would try to ride something with square wheels! If the wheel won’t turn around, I’ll carry on trying to ride it! I do the best job possible on a weekend and if you can’t find a set-up, you have to race with what you’ve got. I’ve always thought that those bikes were difficult to ride and always used to watch them being raced by Valentino as a kid, and think they’re animals and I would’ve loved to have raced that and have a go on them. I got the privilege of going up Goodwood Hill a few years ago on a Yamaha 500 – only up a hill so I was disappointed I didn’t get to race one but it would be a Yamaha 500 two-stroke. A question from John Hookway; Would you prefer to win your home GP or a MotoGP crown with no home win? A MotoGP crown with no home win! I know that sounds bad and all the British fans that come – I would love to be on the podium with the best race ever but still win the Championship, but everyone wants that! I’ll have my home win at some point, but I don’t know when it will be so hopefully I’ll have many over my career and then the crown at some point too. When you win at the British MotoGP, will you be close to tears when they play the national anthem? Yes definitely- racing make me quite an emotional person whether being overjoyed or angry with myself or angry that I couldn’t get something done but I’d definitely be emotional – it’s something that you’re passionate about. I dedicate my life to it and others around me dedicate their life to it for me to go and race a motorcycle. Yeah, 365 days a year spent thinking about that and motorcycle racing, it’s what I do for a living but I love it – I’d probably be crying! Katherine has asked; James Toseland is about to get married and settle down, are there any plans for a Mrs Crutchlow? Yes definitely, I am very comfortable in my relationship with Lucy (Heron) who has stuck by through thick and thin over the years. I had a great Supersport Championship and then Superbike went really well but then last year was a really tough year, but she always reminds me that I was only fast when I started going out with her which is quite funny! She’s probably right so I’ll have to marry her so then I’ll go even faster! Mark Bailey has asked; In your opinion, how much hairspray does Matt Roberts have to use to keep his quiff in perfect order for the camera? A lot. A lot! It’s become a bit of a running joke between me and Matt and he stands at the grid now with the microphone really far back so he can yank it away as soon as I say something bad because I think the first time I swore, I didn’t realise and then I started telling him about his hair because he does really spend hours doing his hair! Then his whole attire that he wears, he wears silk bottoms to one race, something else to the next - it’s good, Matt’s a great guy and we get on well as friends as well as working colleagues as such. Mark Yewell would like to know; Do you think Jorge plucks his unibrow?? I know he grew some hair very recently but how he grew it I don’t know! He’s quite meticulous about that but Jorge is one of the nicest MotoGP riders you can meet, one of the real nice, genuine guys and he has the best talent on the grid – how he’s so consistent, how he comes across to people, he is a true champion. None whatsoever! I never shave, I don’t know, I’m just me. I always say the truth and I always want to be honest and my character is a bit rough and ready and just get on with the racing a motorcycle! Now we’ve got a question from Vinny Gascoigne and I want your honest truthful opinion on this now, would you rather be attacked by a dozen duck-sized horses or one horse-sized duck? Erm, I would say one horse-sized duck because I’m not saying I don’t particularly like horses but I’ve not had the best experiences with them – not that I’ve had a bad experience just I don’t really get on with them. Normally if I’m cycling or something or I’m coming in the car, I don’t know, it must just be me - a bit on edge that they jump so I think I’d probably prefer the duck. David Powell has asked, what are you goals for the next ten years? In ten years time I will be 36 so I would say, you’re at the sort of age of coming out of your career and maybe thinking of retiring by then if I’ve done everything I want to have done in my life, hopefully in the ten years - sitting drinking a Pina Colada on the beach BUT I hope to have achieved my goal of being a MotoGP World Champion then, so it may look a farfetched thing at the moment but that’s what we’re building towards and hopefully we’ll be still living my dream in the next coming years in Moto Grand Prix and I’ll get a shot at that title soon. What do you make of Casey Stoner’s decision to retire? Yeah, it was very disappointing. It was more disappointing for everybody else than it was for him. I think his whole approach to racing has been fantastic over the years – people don’t really give him credit for how fast he is, he is by far the fastest guy on the planet. Maybe just over the years he hasn’t put the Championships together, whether that be machinery or himself sometimes but he is by far the fastest guy and when he did get the machinery, he went and won last year. And when he won the time before, maybe he didn’t have the best machinery but he was the best guy – it’s disappointing because he’s leaving the sport for reasons that, in all honesty he’s correct in some ways...I think that him leaving is a wakeup call for a lot of people but I think if his passion’s not there for the sport anymore, I think he’s right to retire. He’s definitely done a great job and left a legacy on the sport as well. Bit different when you start to win though, do you think if he has another good season, then he might change his mind? I don’t think so, I think he’ll stop and I think that will be it. He said that he’s going to retire and why not, he’s done everything in motorcycle racing. The pinnacle is Moto Grand Prix and if you can win Moto Grand Prix, you’ve done everything you sort of need to do. Now obviously other people want to win it more and more times, he’s won it twice and that’s enough for him. Hopefully for his sake, he wins it this year and then he can say he’s got three and he can leave on a high note but Casey’s one of the best there’s no doubt. Karen Willford would like to know, why are you doing this webchat when you should be getting ready for the pub to watch the England match? That’s a good question. I don’t go down the pub, because I can’t drink so I’m useless at it. I’m not saying I don’t drink alcohol – maybe twice a year or something like that but I am really bad at it and if I have two pints I feel it for a week so there’s no point me going to the pub. I do obviously enjoy the football so it’s on record and I’ll watch it when I get back so hopefully England will win! Another question from Colin Moore, will you ever race the IOM TT? I love the TT and I’m a massive supporter of it. Obviously I live on the IOM and John McGuinness is a great friend of mine, racing it is a different thing. I did my parade lap this year and it was fantastic and did the one last year and I have a massive passion for racing on the roads but I don’t know. It’s a not a question I can answer yes or no, because I would never say no, but I would also not at the minute say yes because I race MotoGP and that’s where my racing lies – on the circuit not on the roads. Gary on Facebook: If you were a better man, would you put money on getting the spare Yamaha seat for the next season – how about you? If I was a betting man...I really don’t know. I think I’ve got a good shout at it but it’s down to the Yamaha bosses, I think at the minute we’ve proved what we can do. Andrea has been in the factory team for three years already, he’s come back to a satellite team and is one of the best riders around but he’s already been in a factory team and maybe that will swing in my favour but my priority is to stay with Yamaha – they’ve been very loyal to me over the last four years and hopefully I can repay them this year and do a good job with them so I’ll wait to see what they want to do first and foremost but if not we’ll look at other options that are on the table.